I used to love coffee that I helped myself with a huge cup of coffee three times a day. Adding a lot of cream like hazelnut and vanilla further encourage my cravings. Flash forward: I am now coffee free for four years and counting. 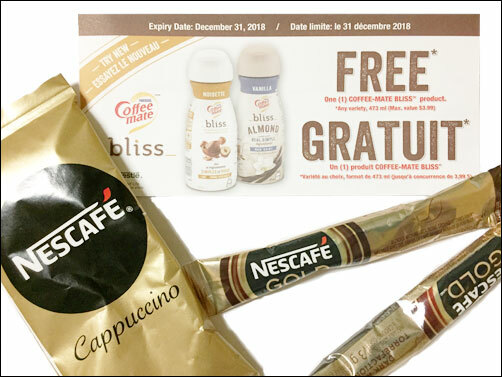 When I see a sample of free Nescafe Gold Cappuccino in the mail, I knew my old-caffeine-fanatic self would jump for joy. Already, turning on the electric kettle then savouring the aroma while time stood still. In reality, I gave the free sample to others who are enamored by caffeine from coffee. My friend has no intention of quitting coffee. While I don’t want things to go to waste. Giving is the perfect solution. But, I though for a second, maybe, I should give it a try. It’s free anyway. Nah. I’m an abstainer (as opposed to moderator). Who knows if it would rekindle the old flame of passion. How Did I Get a Free Nescafe Gold Cappuccino? I had the history of signing up for coupons and samples that my email was flooded with offers and things I couldn’t remember signing up for. Fortunately, it was easy to unsubscribe and the only website I kept was Sample Source on which I haven’t get anything from, because I am slow in signing up for a sample whenever it is available. Why can’t they make it as easy as signing up for The Sample Sale Guys that I was able to buy Tom’s shoes for half the regular price. So to answer the question, I have no idea exactly where the free Nescafe Gold Cappuccino came from. While I cannot tell you how to get Nescafe Gold for free, I’ll let Our Life On a Budget show you on how to get free samples in Canada. What about you, how do you get free samples? What’s the freebie that you received and think it’s a great deal and would even consider buying it.